Chesterhaven Spa Tower transports you to the Eastern Shore. Experience the magic of the Eastern Shore with Waxing Kara’s Chesterhaven Spa Tower. Made to nourish the skin with powerful moisturizers, gentle exfoliants, and enriching minerals, botanicals, and honey. The products in this tower can be used from head to toe for glowing, healthy skin. Free from artificial fragrances, parabens, sulfates, and petroleum ingredients. Chesterhaven Spa Tower treatment is designed to bring outside indoors, while offering a trip to our beautiful Eastern Shore farm. Step 1 – Dry Brush the entire body to warm the skin and prepare it for detoxification. Light our Chesterhaven Spa Candle to get the oils melting, which you will use later in this treatment protocol. Step 2 – Soak in warm water enriched with Waxing Kara™ Peace Soak. Sodium and potassium levels are well-kept secrets to both physical health and mental well-being. They influence the fluid balance in the body, which is regulated by the Adrenal gland, which in turn affects the healthy function of the kidneys. A far-reaching domino effect is ignited in the body when sodium and potassium levels are skewed. Soaking in Mineral Salts helps restore balance, fortifying your well-being as they coax you into relaxation. Step 3 – Cleanse and exfoliate your face and body with Waxing Kara Chesterhaven Salt Scrub. 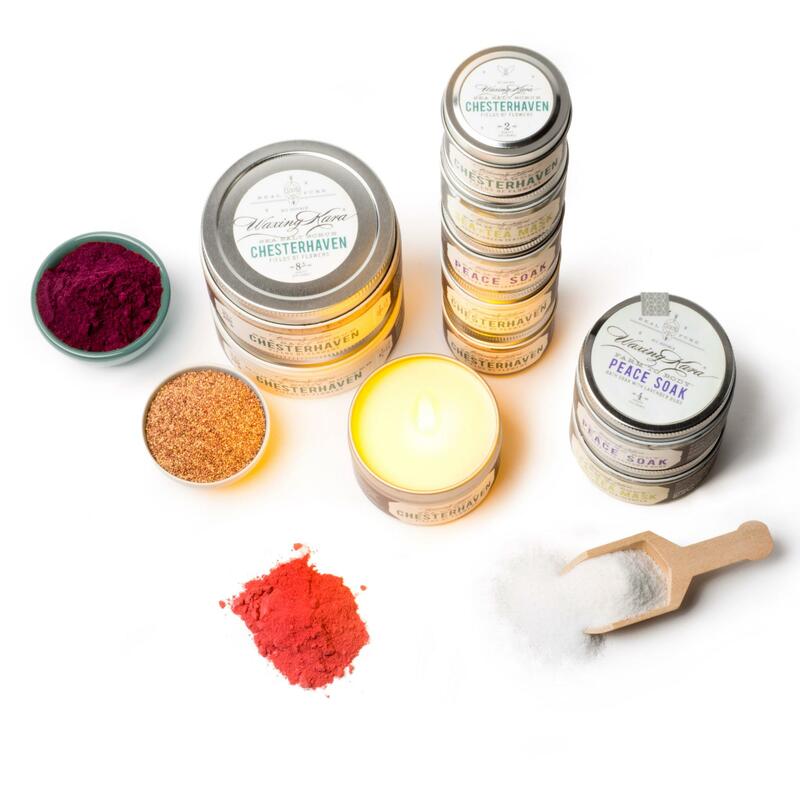 We’ve blended fine pink mineral salt with a large amount of shea butter to create a deliciously rich exfoliant system that nourishes the skin while strawberry seeds assist in sloughing expired cells to reveal the fresh, healthy tissue. Directions: Apply to skin using gentle, circular motions on face and body. Rinse with warm water or warm towels and towel dry. Step 4 –Fortify and protect with Waxing Kara Sea+Tea Mask. 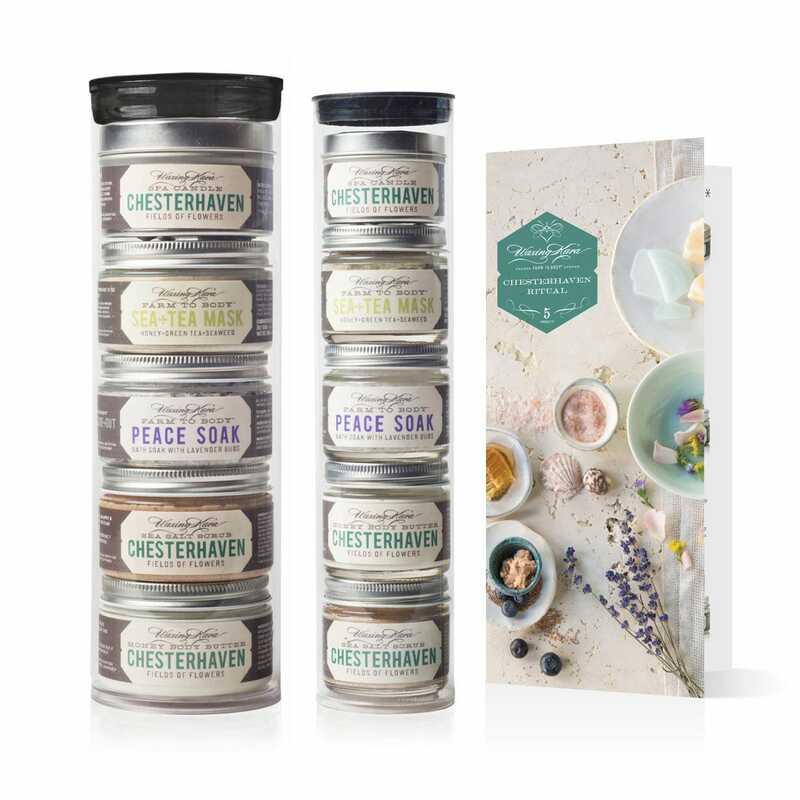 A symphony of green tea, seaweed and clay treats, tones and refines skin as it replenishes vital minerals. The clay cleanses impurities from the skin’s surface to help prevent clogged pores. Nourishing, mineral-rich seaweed restores vitality to dehydrated skin, while green tea repairs and helps to slow signs of aging. This ensemble leads to smooth, hydrated and invigorated skin. Mix with water, or other mixers suggested below targeted for your skin type. 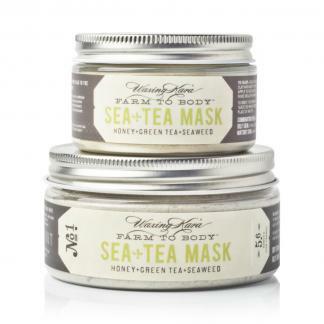 Sea+Tea for healthy radiant skin, in perfect harmony. Paint freshly blended mask onto skin and allow remaining for 10-15 minutes. Rinse with warm water or warm towels and towel dry. We recommend treating yourself to a petite facial with this mask or gently rub your feet and rotate your ankles as you relax while the face and body mask works its magic. 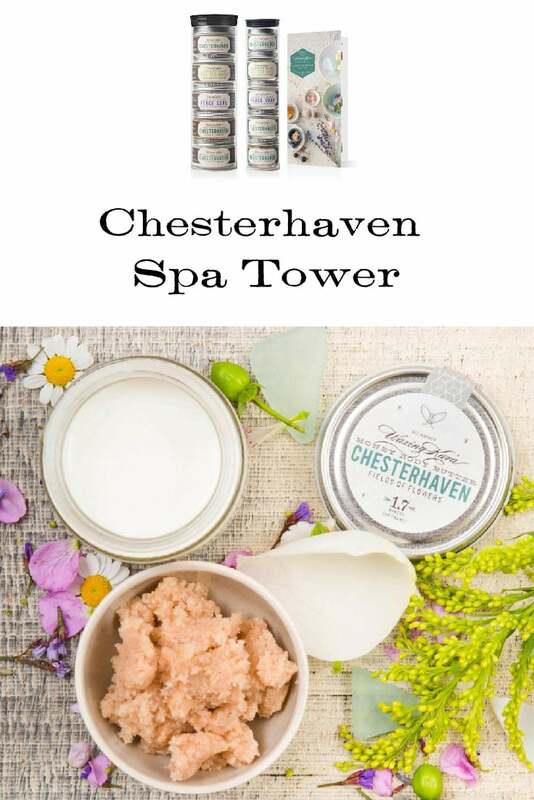 Step 5 – Massage freshly cleansed skin and be sure to get all the dry patches and parts (heels, knees and elbows) with the oil from our beautiful Chesterhaven Spa Candle. 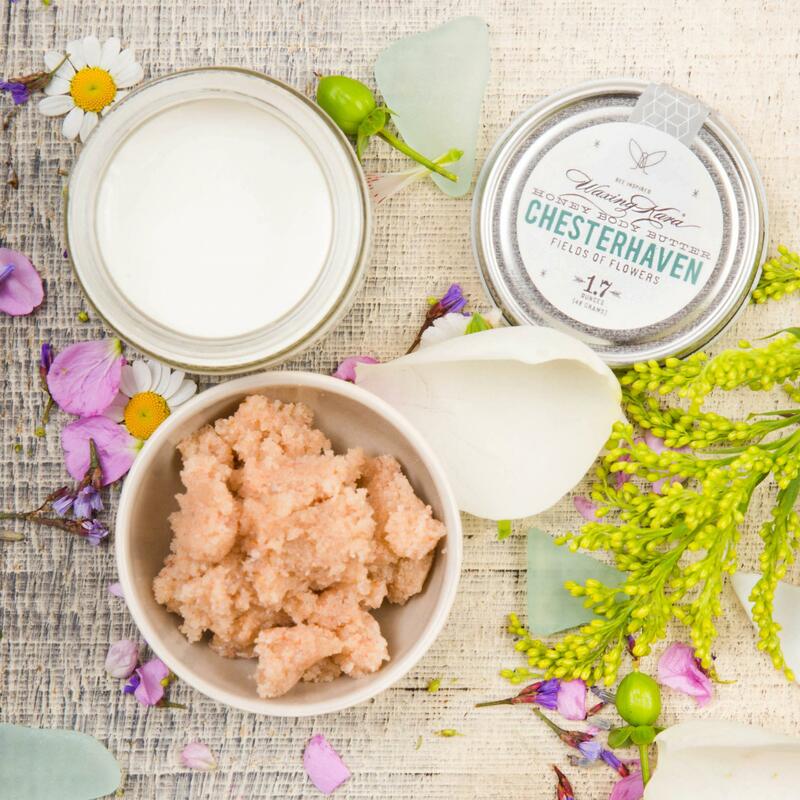 Finish up with our Chesterhaven Body Butter. Lock in all of these important nutrients and seal the skin with our butter which features honey, cocoa butter, and sweet almond oil. The result is skin that’s as smooth as you can possibly imagine. I love the Waxing Kara spa towers! The body butter has a fabulous texture and is so moisturizing! This scent is lovely and long lasting. The scrub is wonderful as are the bath salts. Have not tried the rest of the products in this tower yet, but looking forward to doing so. I know they will not disappoint!